Included in the box: 7” LCD monitor screen with mounting bracket installed and necessary cables, stitch camera w/mounting bracket, heavy duty power supply with cord, package of clips and supplies to attach unit, and “pantograph” camera (if ordered as dual unit). 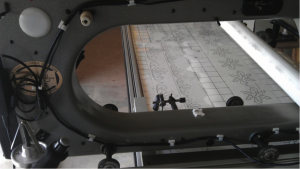 Look at your quilting machine and determine where you desire to mount A Quilter’s Eye (i.e., top front/top back, left side or on handle bars of your longarm). The monitor can swivel on the base if you need to change the view from the front of your machine to the back and can be raised or lowered. Use the alcohol wipes to clean the surface of your quilting machine where the monitor, camera and clips are to be installed to remove any oils and surface dust. Let the area dry. The dual lock strips we have included have a strong adhesive and can possibly remove machine paint if they need to be moved once adhered. 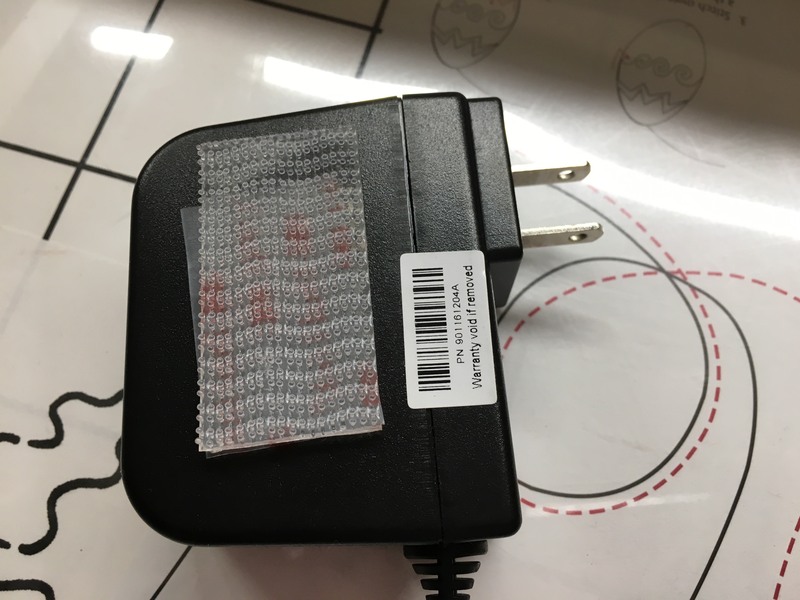 Before removing adhesive backing to apply the strips, we recommend experimenting with placement and then marking where you desire the strips to be. Peel away the sticky back from 2 strips of the dual lock. Adhere them on the top of the longarm as shown. Leave space (up to as much as 1″) in between strips (as much as possible). Press 2 more strips of the dual lock to those you have already applied, peel away the backing and then firmly press the monitor in place onto the dual lock strips. Notice the tiny paper tab in the corner of the monitor. Holding the monitor base down with one hand carefully pull the tab upward and across to remove the monitor screen protector. The screen can be tilted to your preference by loosening the thumb screw on the left back. Tilt the screen to your best view and tighten. Once the monitor is mounted, we’re going to start feeding the cables through provided clips starting at the top by anchoring the cable few inches past the camera on/off switch. The two camera cables have been tied together. Remove the tie and take the cluster of cables tied with the black tie and untwist. Take a few clips and slip the cable into them. 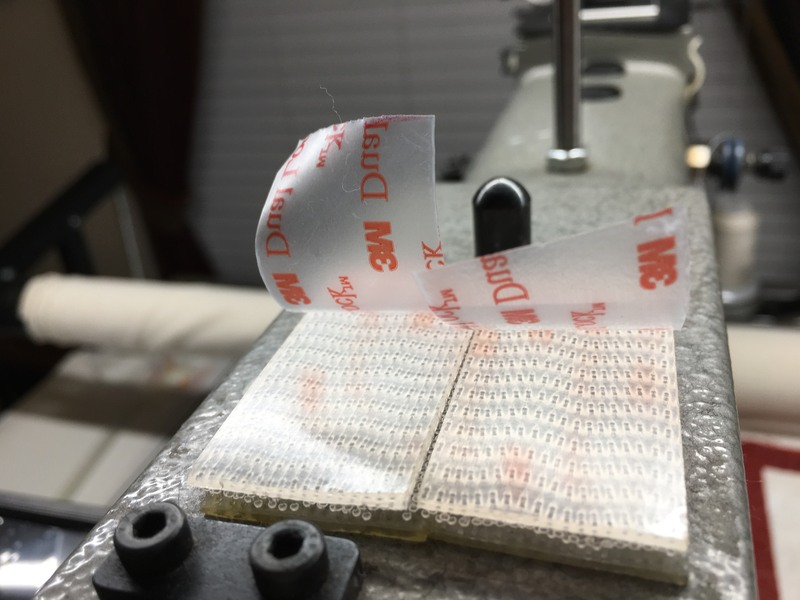 Starting several inches from the clip at the top and before peeling off the paper backing, take the clips and slide them every 5 to 7 inches apart along the upper left side of your quilting machine heading to the back. Peel off the thin layer of paper on each clip and secure to machine. Sometimes the paper backing is difficult to remove. We recommend sliding a straight pin or bent paper clip just underneath the paper to start the peeling. Continue adding and securing clips down the side and now moving forward to the front of your quilting machine (see photos). Take the smallest piece of dual lock and attach to the bracket of the stitch camera (camera with four small LED lights). Connect the yellow end of the cable to the yellow end of the stitch camera. Connect the black end of the cable to the black end of the laser camera. Push the red end into the power adapter. ***If you purchased a single camera unit, using some of the clips, feed the laser camera cable to the back of your machine and secure. 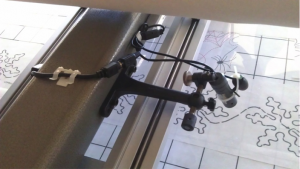 Place another piece of dual lock on your longarm wall as low and as close to the front as you can. Because the view is so magnified, push the camera into the dual lock as low as you can, making certain that you have at least 25% of overlap on both of pieces of dual lock. Make sure you have a small clip close to the dual lock piece. Depending on the size of your quilting machine you may have some wire “slack.” If so, attach the included large clip towards the back of your machine to coil up and secure any excess wiring (see photo). Find the power source in the box. Locate where you would like to place it on your longarm (on the back side, towards the back, etc.). Place one strip of dual lock vertically onto the power source. Then place a second strip of dual lock onto the strip you’ve already placed, locking it in. 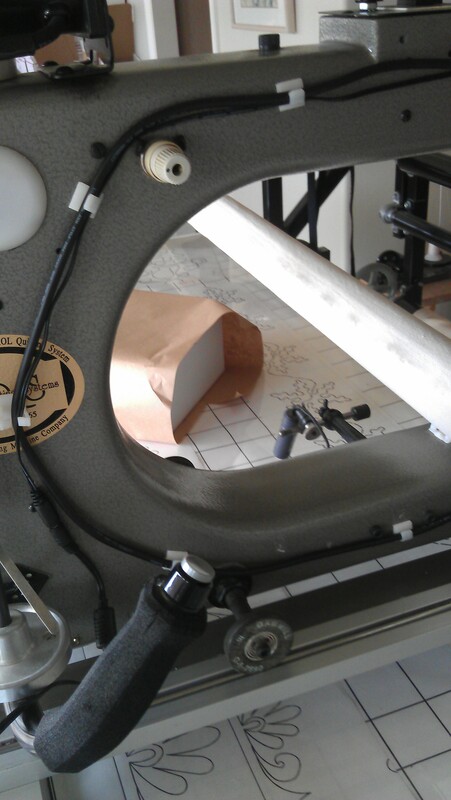 Peel the backing and press the power source firmly onto the longarm. **You will need to provide your own extension cord with a length long enough to accommodate the movement of your machine. 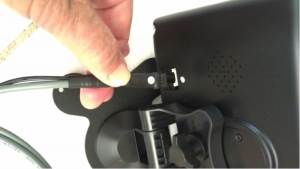 Take the cable coming from the power source and push it into the matching cable end coming from your monitor. If you purchased A Quilter’s Eye 2 take the extra cable with the white tie and extend it over the bottom arm of your longarm. Take your remaining piece of Dual Lock and cut it in half into 2 small squares. Apply one piece to your new panto camera and the other piece to your laser light on your longarm securing them together. Point the panto camera in the direction of your pantograft pattern. If the orientation is not correct (going in the proper direction that you quilt) simply rotate the camera on the bracket). 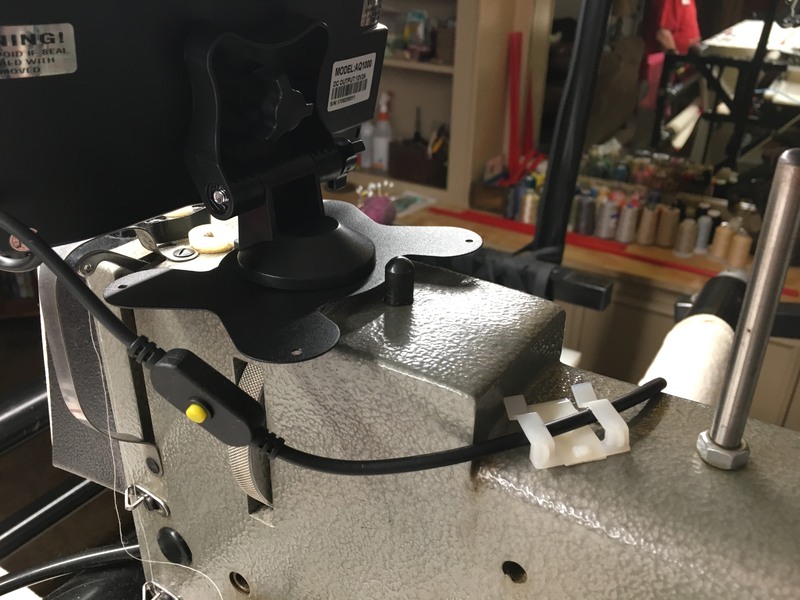 If you prefer, you can secure the camera to the laser light on your longarm using a zip tie. 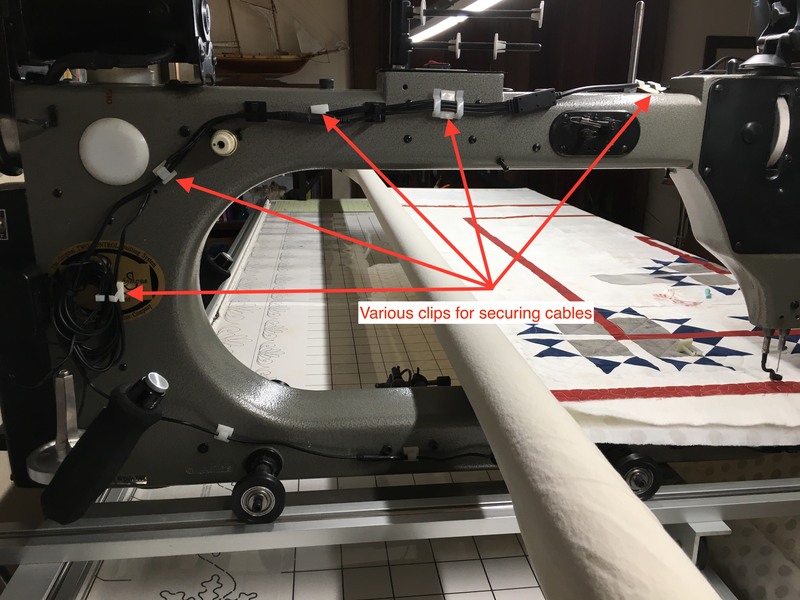 Using the flat clip secure cable over the bottom arm of your longarm with the opening of the clip facing towards the back. Wind excess cabling where previous cabling is already secured. 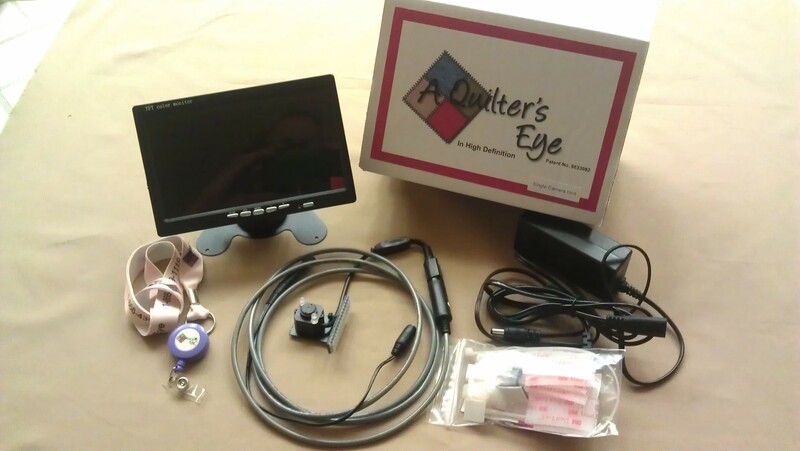 Push the lower right button on the monitor to turn A Quilter’s Eye on. If the screen is blue with no picture, press V1/V2 button to change camera displays. The V1 screen is what shows the stitching under the quilt, and the V2 screen shows the pantograph pattern if the “panto” camera was also purchased. The stitch camera comes to you already focused at 1 ½ inches from the top of the camera to the quilt back. 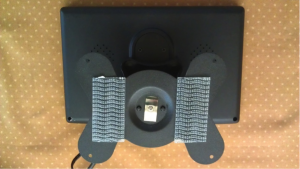 If the stitches are not clear, the view from the camera can be altered by turning the black disk in the center of the camera in small increments counter-clock wise for a closer view and clock wise for a wider view. In the center of the camera top is a tiny hole which is the lens – DO NOT TOUCH. On the outside of the lens are two tiny holes. 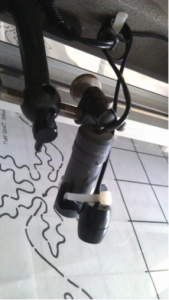 Using a bent paperclip or Tpin, insert in one of the two holes and slightly turn the camera for focus to your longarm. You can move the camera unit up/down or front/back along the strip of Dual Lock per your preference. Keep in mind that there must be at least 25% of the camera base attached to the Dual Lock to keep the camera securely in place. If you ordered the dual unit with the “panto” camera, turn on your laser to show where the light is on your pantograph pattern. Attach the “panto” camera to your laser light or machine wall and position it so it shows your laser light on the monitor. Occasionally the “panto” camera isn’t orientated correctly – meaning the view on the monitor screen isn’t going in the correct direction (ie, you are moving from left to right, but the monitor shows movement from right to left). To adjust, slightly rotate the bracket between the two halves of the “panto” camera until the orientation is correct. 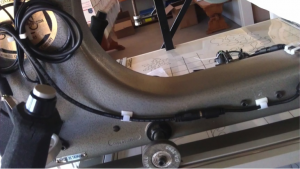 The cable can go over the top of the lower arm secured by a flat clip or if your machine allows under the lower arm. Face the clip with the opening towards the back of your machine to secure the wire. Attach camera to the cable. Push the V2 button on the monitor screen and adjust the angle and position of the camera so that your view is following the laser light. Remember, if needed, you can slightly unscrew the laser light for the correct orientation. 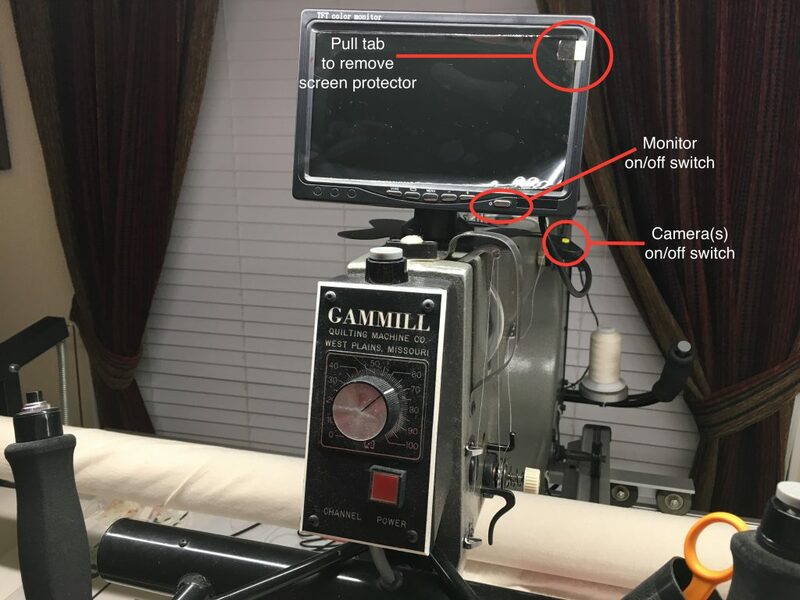 Remember – the view of the stitching on the back of a quilt is on the V1 screen, and the view of the pantograph is on the V2 screen changed by simply pushing the button on the front of the monitor. Load a previously quilted quilt or sample quilt on your machine preferably quilted with a colored thread not matching the fabric. Attach the camera as directed above. Make sure the camera lens is clean gently using the QTip on the pinhole lens. If focus needs to be changed, pull the camera away while still connected to the cable. Point it towards any stitching (even the top of the quilt) the same distance from the fabric as it would be if the camera was mounted to the machine. Remember, we send the camera already focused to 1 1/2″ from the top of the camera to the back of the quilt. If possible, mount your dual lock so that the camera rests in that position before trying to refocus. 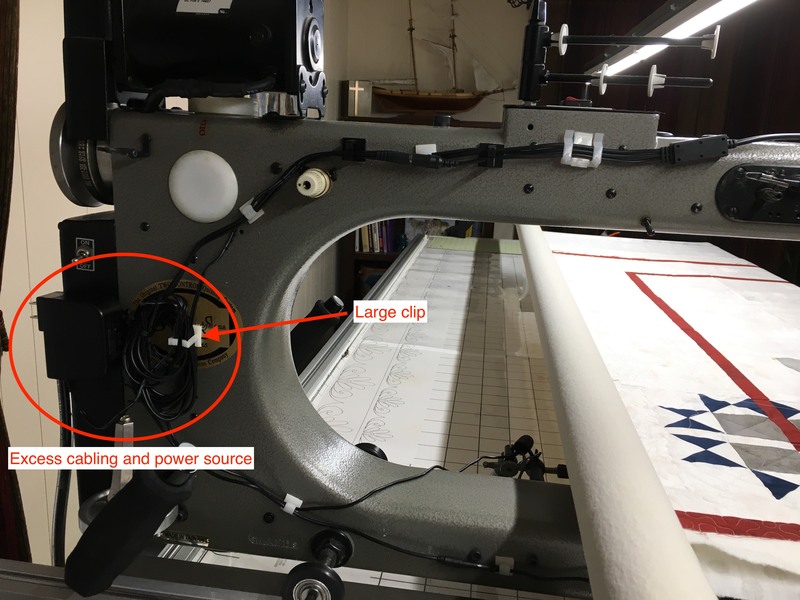 Additional pictures of viewing the stitching on the back, applications of A Quilter’s Eye on different machines, etc., are shown on our website under the heading Photo Gallery. These pictures have not been altered or changed in any way. For easiest installation, you can watch our installation video here. You can also view the written installation manual below the video which can also be downloaded. Included in the box: 7” LCD monitor screen with mounting bracket installed and necessary cable, stitch camera w/mounting bracket, heavy duty power supply with cord, package of clips and supplies to attach unit, and “pantograph” camera (if ordered as dual unit). Look at your quilting machine and determine where you desire to mount A Quilter’s Eye (i.e., top front/top back, left side). The monitor can swivel on the base if you need to change the view from the front of your machine to the back. Peel away the sticky back from 2 strips of the dual lock. Adhere them at least one inch apart on the bottom of the monitor base as shown. 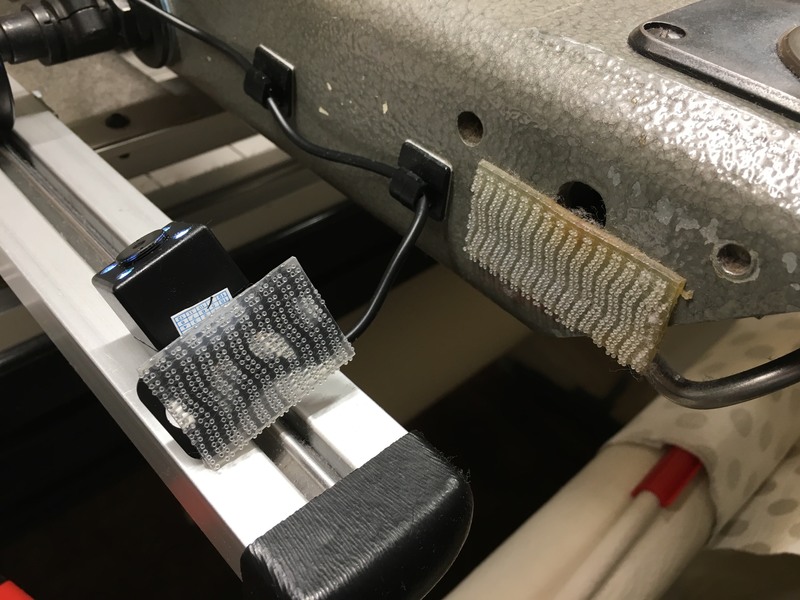 Press 2 more strips of the dual lock to those you have already applied, peel away the backing and then firmly press the monitor in place on the clean surface of your quilting machine. 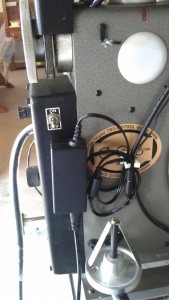 Take the coiled wire and push the end with the white dot into the connector at the back of the monitor aligning the dots (see photo). 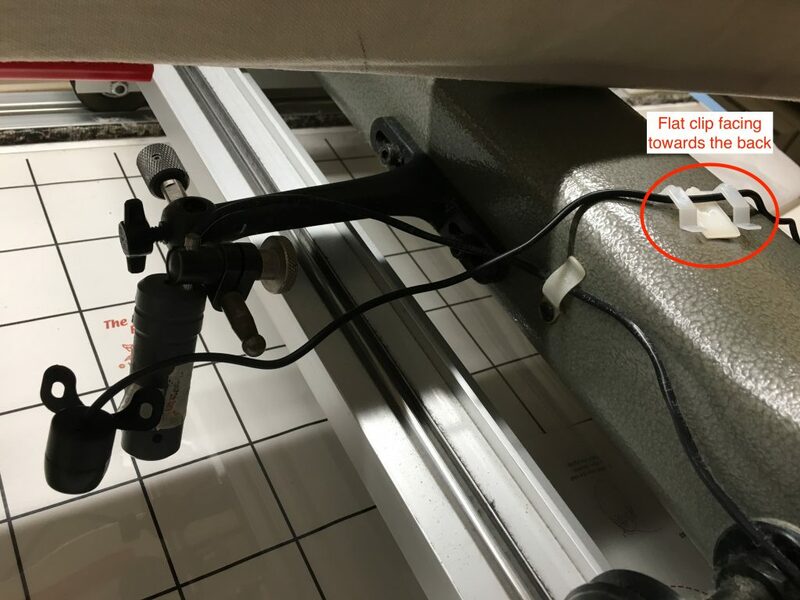 Gently place the wiring over the machine to the left side and let it rest on your machine or machine table so that its weight isn’t hanging down towards the floor. 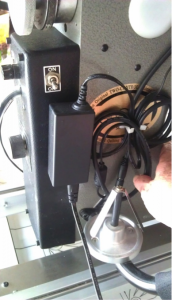 The power source “box” has a strip of Dual Lock already in place on the back. 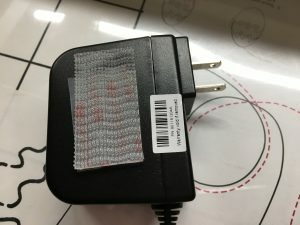 Peel off the film of the matching piece and push the power source securely on the left side of your machine near the back (see photo). You will need to provide your own extension cord with a length long enough to accommodate the movement of your machine. Take the wire coming from the power source with the “round” end and push it into the “like” end of the black wire coming from your monitor. 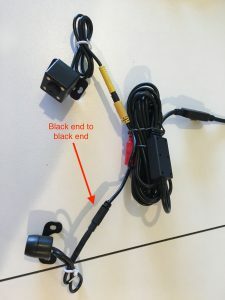 Take the camera segment and push the end with the connector into the end of the gray monitor wire carefully aligning the small pins inside. We have put a white dot on each end to assist you in aligning them as the pins can be easily bent. IMPORTANT: Be sure to place the clips and wires out of the way of any moving machine parts or moving thread! 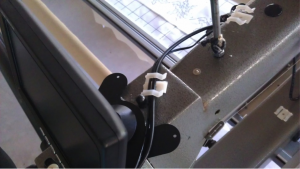 Before peeling off the back, place one of the larger flat clips on the two monitor wires just a couple of inches from where the wires come from the back of the monitor . You can now slide the clip up/down the wire to find a flat space on your machine (see photo suggestion). 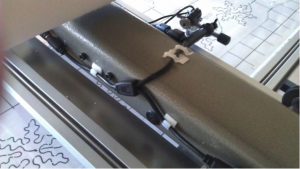 Peel off the paper back and secure the clip with the wires to your machine. Sometimes the paper backing is difficult to remove. We recommend sliding a straight pin or bent paper clip just underneath the paper to start the peeling. Starting several inches from the flat clip and before peeling off the paper backing, put a few small clips on the wires and slide them every 5 to 7 inches apart along the upper left side of your quilting machine heading to the back. Peel off the thin layer of paper on each clip and secure to machine. Continue adding and securing clips down the side and now moving forward to the front of your quilting machine (see photos). 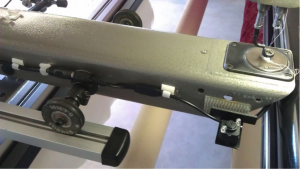 At the very front of your machine add a piece of Dual Lock horizontally on the outside wall next to the bobbin case as low as your machine wall will allow because the view is so magnified from the camera (see photo). Press the camera bracket into the Dual Lock. 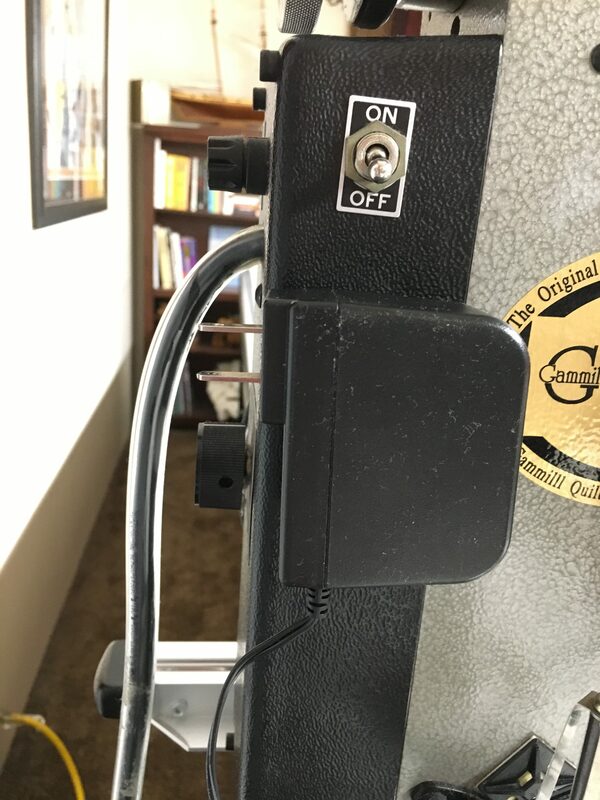 *Be sure to place a small clip on each side of the camera/wire connection (see photo above). Add cord to the power source and plug into your wall or, if needed, into an extension cord for extra length. 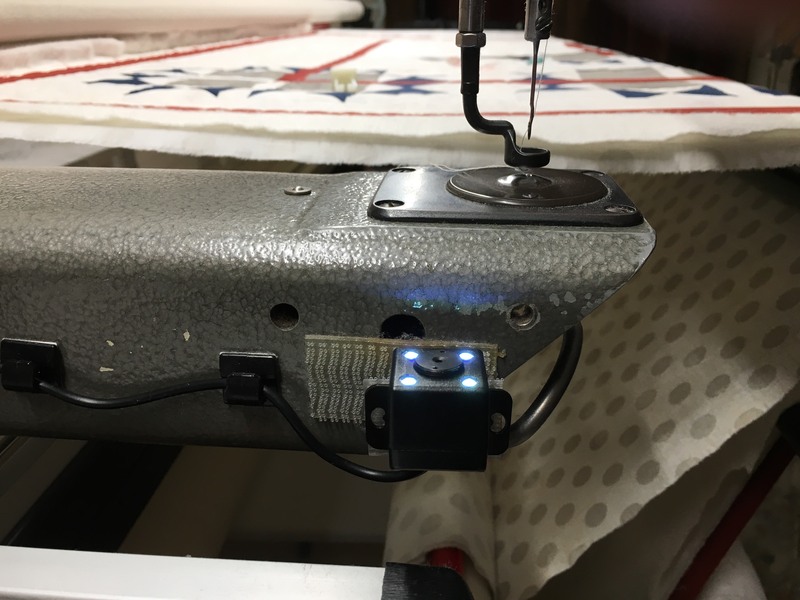 If the quilting arm on your machine is longer than 28” you will need us to provide you with a “Y” connector to add the extra wire length needed along the bottom. *Handy tip from a fellow user: If you are having trouble seeing the light from your laser camera on the pantograph pattern, try placing a colored (ie, green, or red) clear Saran Wrap over the pantograph pattern. Load a previously quilted quilt or sample quilt on your machine. 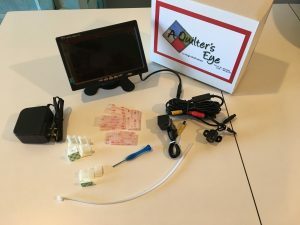 Thank you for your purchase of A Quilter’s Eye. Enjoy and Happy Quilting!